"Place" awards have priority over any "Class" (Under) prizes. Chess medals for all players who finish with 2.5 or more points. Participation Ribbons for all K3, K5 and K8 players. 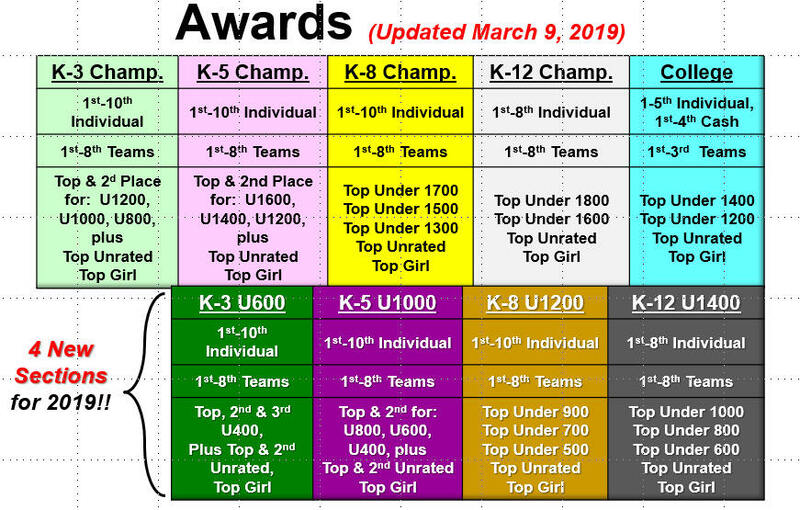 Blitz Awards: 1st-8th Individual and 1st-5th Tams in K5 and K12 Blitz Sections. 1st & 2nd Individual & Teams in the College Section. Parents & Friends: All prizes are Book Store Gift Certificates. 1st-3rd Place minimum, more prizes if more than 10 players. Value of Gift Certificates based on number of entries.